Velour - Vintage Clothing Melbourne, Australia: If I were looking for a white rabbit, I'd ask the Mad Hatter. If I were looking for a white rabbit, I'd ask the Mad Hatter. 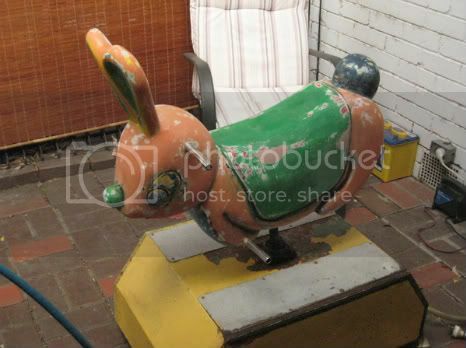 So a friend and I have been restoring a kids ride to wonderland condition for the shops Easter window/our general entertainment. He will also have a little bowler hat and fob watch as of tomorrow, but i'm impatient to share him and will be busy busy with the sale over the weekend. 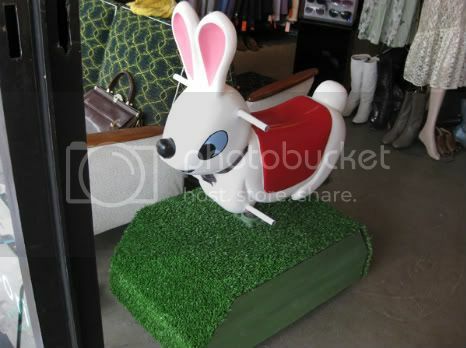 The base is covered in fake grass, the sides are chalkboard, and yes, HE WORKS! I have something of an obsession with Alice in Wonderland and already know what my next project will be, stay tuned! I'll have him available for hire also, just email me. oh my gosh! where did you find that superb rabbit!? Great job! He's a cutie with his make-over!